We will offer an annual workshop on aptamer selection, characterisation and application. The workshop covers all practical and theoretical aspects of aptamers and is scheduled for a duration of 4 days. Additional topics, such as Next Generation Sequencing (NGS) aptamer sequence analysis and binding assay methods will also be covered. 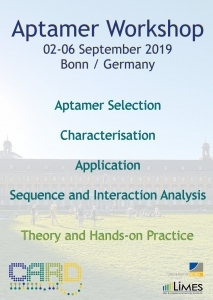 The Workshop will take place in Bonn, Germany on 2-6 September 2019. “I was first introduced to Aptamers last year when I started writing my PhD proposal. I had so many questions on both theoretical and practical aspects of this relatively new and promising field of research. I found the Aptamer workshop on line; the participants were a mix of researchers who worked with Aptamers and needed additional advice and training and others who were new to Aptamer technology. The workshop was a satisfying experience, all my questions were answered, and every step of the experimental work was fully reviewed so that those who were new to the procedure were able to keep up with others. Dr Gunter was very candid in explaining the limitations of Aptamers, and fully explained different aspects of their discovery. Other members of the workshop team were very cooperative, helpful, and available for any inquiry. I highly recommend this workshop for researchers interested in Aptamers, it is a wonderful and unique opportunity to benefit from the vast experience of this center in Aptamer technology “.